Global Earthquakes by Month and Day Over the Last 40 Years. | Chaos Sweeps Away the World We Know! The Disaster, current events & Catastrophe Blog. Forecasts for 2014 to 2022. Read tomorrows news today! Plus current economic, commodities, stock indices and financial news. ← Happy Memorial Day 2013 – Be Safe. Global Earthquakes by Month and Day Over the Last 40 Years. May 26, 2013 – Global Earthquakes by Month and Day: I updated my Global Earthquakes Database. The two graphs, above, reflect global earthquake greater than or equal to 6.0 magnitude; from 1973 to May 25, 2013. The 5,685 earthquakes are distributed by month and day of the month through the 28th. Notice that there is a large variation by month. March, April and October are high months; while February, June and July are low months. Similarly, the distribution by day of the month shows great variation. The 11th day of the month is the highest, while the 27th is the lowest. The columns read, from left to right, date, time (24 hour format), latitude (+ is North and – is South), longitude (+ is East and – is West), depth in kilometers, magnitude and earthquake sequence number. As you can clearly see, the two deep Russian earthquakes placed number three deepest (for the 6.8 magnitude) and number 8th for the 8.3 magnitude. 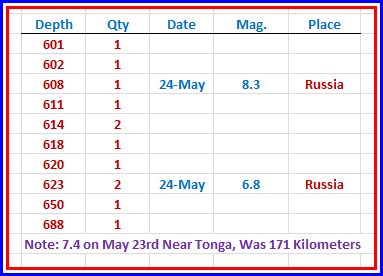 The note reflects the Tonga 7.4 magnitude quake of May 23rd, at 171 kilometers. This entry was posted in Earthquake, Russia, Tonga and tagged Apparent magnitude, Earth Sciences, Earthquake, Master of Disaster, russia, tonga. Bookmark the permalink.